Once the well-trafficked merchant corridor of Gold Rush Sacramento and later the circuit for teenage cruisers, Sacramento’s K Street has a vibrant and colorful past. 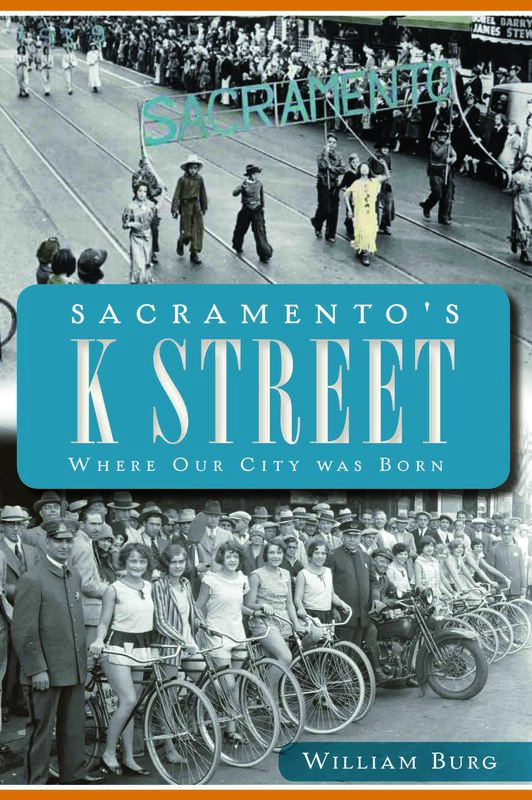 This summer, The History Press is proud to announce a new book by Sacramento historian William Burg Sacramento’s K Street: Where Our City Was Born. From its founding, K Street mirrored the entrepreneurial development of California’s Capitol City. Initially the storefront for gold seekers trampling a path between the Sacramento River and Sutter’s Fort, K Street soon became the hub of California’s first stagecoach, railroad, and riverboat networks. Over the years, K Street boasted saloons and vaudeville houses, the neon buzz of jazz clubs and movie theatres, as well as the finest hotels and department stores. For the postwar generation, K Street was synonymous with Christmas shopping and teenage cruising. From the Golden Eagle and Buddy Baer’s, to Weinstock’s and the Alhambra Theatre, join historian William Burg as he chronicles the legacy of Sacramento’s K Street, once a boulevard of aspirations and bustling commerce, now home to a spirit of renewal. Sacramento’s K Street: Where Our City Was Born by William Burg will be available from The History Press and Sacramento bookstores in summer 2012.